This is an edited transcript of Helga Zepp-LaRouche's presentation at the Stockholm EIR/Schiller Institute Seminar, Jan. 11, 2017. A PDF version of this transcript appears in the January 20, 2017 issue of Executive Intelligence Review and is re-published here with permission. “Sublime” is the only fitting word to describe Helga Zepp-LaRouche’s deep and beautiful presentation and the atmosphere she created in the audience of 60 participants (full room capacity) at the Schiller Institute/EIR seminar held in Stockholm on January 11th, under the title “Donald Trump and the New International Paradigm.” Her speech moved the audience to address the fundamental epistemological, deep­er meaning of the New Silk Road, and the meaning of the development of mankind in the universe. This deeper meaning even touched the diplomats present. An ambassador from an important Asian country started to discuss exactly the need to address these broader cultural and human implications, during the question period. In all, there were seventeen diplomats present, among them seven ambassadors. Four European countries were represented, nine from Asia, and four from Africa. Among the other participants, there were contacts from different Swedish associations working for friendship with Russia, Ukraine, Syria, Yemen, Somalia, and the Baltic Sea area, and another group working to leave the EU. 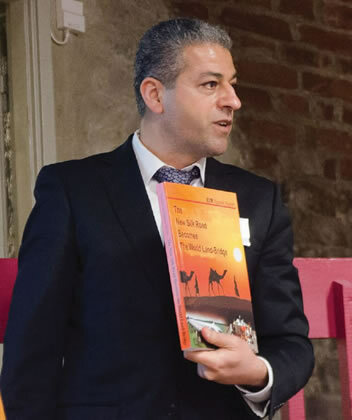 The Chairman of the Schiller Institute in Sweden, Hussein Askary, moderated, and welcomed the participants. Helga Zepp-LaRouche then gave the keynote address, in which she evaluated the ongoing struggle to turn around the election of Donald Trump by the outgoing neoconservatives and mainstream media. She pointed to the broad reaction to the neoliberal-instigated disaster as the real basis for the election of Trump, as well as other such reactions around the world, and said that is the place to look for the reason why Trump was elected, and not any hacking of computers. As the audience members were mainly new people, she presented the history of the Schiller Institute, which is also the history of the New Silk Road policy. She described how the economy evolves from one platform to another, and pointed to the Chinese policy for pushing for the next platform of the economy with Moon-based industrial development, for the further development of mankind as a non-Earth-bound species. The Chinese motivations for their worldwide policy came up in the discussion period, in the context of Africa. Helga then stressed, with her background of long study of China’s history and Confucian thought, that her conclusion is that China is really pursuing a “win-win” policy based on the Confucian notion of pursuit of wisdom and harmony. She stressed the need for a Classical renaissance for the New Paradigm to succeed, and that this is something we cannot leave to Trump. Helga Zepp-LaRouche: Good day, ladies and gentlemen. We are indeed in very, very fascinating times. And I think there is much reason to be hopeful. I know that for the last sixteen years, most people in the United States and Europe thought there is no great future. But I think that there are accumulations of strategic realignments which have shaped up over the last three years, but especially in the last year, where one can actually see that the potential for a completely new kind of relation among nations is on the horizon, and that we may actually have the chance to bring a peaceful world. 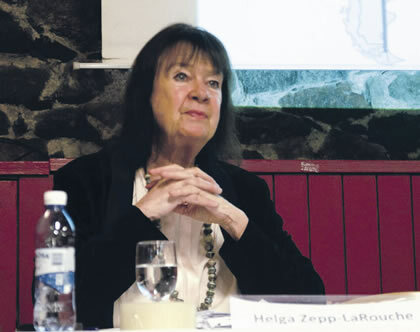 Helga Zepp-LaRouche at the Stockholm event. Now, obviously, in the system of globalization as we have known it, especially since the collapse of the Soviet Union, that system is completely unhinged and this is cause for a lot of freaked-out reactions by those people who were the beneficiaries of that system of globalization, but I will hopefully be able to develop that this is a temporary phenomenon, and it will be replaced by some more optimistic developments. What we see right now is a completely new paradigm emerging, a system which is based on the development of all, a “win-win” potential to cooperate among nations, and obviously the idea for what was the axiomatic basis of the globalization system since 1991 to insist on a unipolar world, is failing, or has failed already. And with that, a system which tried to maintain this unipolar world with the policy of regime change, of color revolution, or humanitarian intervention, or so-called humanitarian intervention to defend democracy and human rights, obviously has led the world to a terrible condition, but this is now coming to an end. So obviously, the statement by Francis Fukuyama at the end of the Soviet Union that this was the “end of history” and that there would be now only democracy, was really premature; because you have a complete backlash right now, which takes different forms in different in different parts of the world against this system of globalization, and in the Asian countries it takes the form of more and more countries joining with the New Silk Road perspective offered by China, the offer to work together in a “win-win” cooperation with the Belt and Road Initiative which is now already involving more than 100 nations and international organizations; and is already engaged in the largest infrastructure project in the history of mankind. This new paradigm economic system already involves 4.4 billion people; it is already, in terms of spending, in terms of buying power in today’s dollars, twelve times as big as the Marshall Plan was after the Second World War, and is open for every country to join, including Sweden, including the United States, and including every other country on the planet. And I will talk about that in a little while. And in the trans-Atlantic sector you have a different kind of anti-globalization revolt, which is still ongoing; it’s not yet settled how this will turn out. It started in a visible form with the vote of the British population in June last year for the Brexit, which was the first real upset; everybody was taken totally unawares, except a few insiders. This anti-globalization revolt was obviously continued with the election of President Donald Trump in the United States; it was continued with the “no” to the Italian referendum organized by Prime Minister Matteo Renzi, to change the Constitution. And what’s common to all of these developments, Brexit, Trump, the “no” to the referendum in Italy, is they are caused by a fundamental feeling of injustice of ever-larger parts of the population which were victims of that system, which increasingly made the rich richer, made more billionaires richer, but destroyed increasingly the middle range of society, and made the poor poorer. It is my deepest conviction that that revolt will continue until the causes of this injustice are removed, and it will continue—it will hold the measuring rod to President Trump, whether he will fulfill his election promises; and if he does not do that, I believe the same people would turn against Trump as they turned against Hillary. So that means that the future of the European Union and the euro is very doubtful. We have elections coming this year in France in April. This election, as of now, is completely up in the air. There is no firm prediction possible. You have a very tumultuous situation in Italy, where a coup was just attempted by Beppe Grillo and Verhofstadt in the European Parliament, which failed. They were trying to get the Five Star Party into the liberal group ALDE in the European Parliament, which was rejected by the liberal group, so it failed. Then you will have elections in Holland, and in September in Germany, where the star of Mrs. Merkel is also no longer as shiny as it may have been a while ago. So we are looking at dramatic changes. Now, let me start with the Trump election. In my whole political life, which is now becoming quite long, several decades—I have never in my whole political life, seen such hysteria on the side of the neocons, on the side of the mainstream politicians, and on the side of the liberal media, as concerning Trump. Now, admittedly, Trump does not fulfill the behavior code of Baron von Knigge, who was a German in the 18th century who developed the code for good diplomatic behavior. But what caused Trump’s victory, is that he simply promised to end the political paradigm which was the basis of eight years of George W. Bush and eight years of Barack Obama, which was a direct continuation of the Bush-Cheney policy. 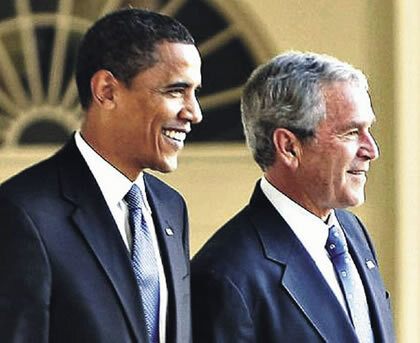 Barack Obama and George W. Bush. And it was a good thing, because it was very clear that if Hillary Clinton had won the election in the United States, that all the policies she was pursuing—including a no-fly zone over Syria, and an extremely bellicose policy towards Russia and China—would have meant that we would have been on the direct course to World War III. If you have any doubts about that I’m perfectly happy to answer questions about that, in the question and answer period. So the fact that Hillary did not win the election was extremely important for the maintenance of world peace. And I think that of all the promises that Trump made so far, the fact that he said that he will normalize the relationship between the United States and Russia, is, in my view the most important step. Because if the relationship between the United States and Russia is decent, and is based on trust and cooperation, I think there is a basis to solve all other problems in the world. And if that relationship were adversarial, world peace would be in extreme danger. So from my standpoint, there is reason to believe that this will happen. The Russian reaction has been very moderate, but optimistic that this may happen. If you look at the appointments, you have several cabinet members and other people in high posts who are also for improving the relationship with Russia, such as Tillerson who is supposed to become Secretary of State, and General Flynn, who is a conservative military man but also for normalization with Russia, and many others, so I think this is a good sign. Now, if you look at the reaction of the neocon/neoliberal faction on both sides of the Atlantic to this election of Trump, you can only describe it as completely hysterical. The Washington Post today has an article, “How To Remove Trump from Office,” calling him a liar, just about every derogatory term you can possibly imagine, just on and on: unbelievable! The reaction in Germany was—von der Leyen, the Defense Minister, on the morning after the election said she was “deeply shocked,” this was “terrible,” this was a catastrophe, and it keeps going like that. So they have not recovered.And then naturally, you have the reports by the different U.S. intelligence services, Clapper, Brennan, Comey from the FBI—they all put out the claim that that it was Russian hacking of the emails of the DNC and Podesta which stole the election, because they allegedly shifted the view of the Americans to vote for Trump. Now, I think this is ridiculous. Not only have many cyber experts, in Europe but also in the United States, already said that all the signs are that it was not a hacking but an insider leak got this information out. This is more and more likely, and there’s absolutely zero proof that it was Russian hacking. Naturally, what is being covered up with this story, is what was the “hacking” about? It was “hacking” of emails that proved that Hillary Clinton manipulated the election against Bernie Sanders! That is not being talked about any more; but I would say, look there, and there are many people who recognize it. For example, a very important French intelligence person, Eric Denécé, who is a top-level think tanker in France, said: Well, it is quite clear why they put out this story, because the neocons had to expect the great cleanup, and many of them would lose their positions, and this is why they all agreed on this story and changed the narrative. The real narrative is that it was the injustice of the neoliberal system of globalization which simply violated the interests of the majority of the people, especially in the “Rust Belt.” Hillary Clinton in the election campaign was so arrogant that she didn’t even go to Ohio or some of the other states which were formerly industrialized, where you have to see that the United States—contrary to what mostly is reported in the Western media in Europe—the United States is in a state of economic collapse. It has for the first time a falling life-expectancy; there is one indicator which shows whether a society is doing well or badly, and that is whether the life-expectancy increases or falls. In the United States it’s falling for the first time for both men and women. In the period of the sixteen years of Bush-Cheney and Obama, which you can take as one package, the suicide rate has quadrupled in all age brackets; the reasons being alcoholism, drug addiction, hopelessness, and depression because of unemployment. There are about 94 million Americans who are of working age who are not even counted in the statistics, because they have given up all hope of ever finding a job again. If you have recently travelled in the United States, the United States is really in a terrible condition; the infrastructure is in a horrible condition, and people are just not happy. So the vote, therefore, the narrative—that was the reason why Hillary was voted out, because she was perceived as the direct continuation of these sixteen years, and so the attempt to change that narrative by saying it was “Russian hacking” is pretty obvious. Now, however, we have nine days left, until the new President comes in. And this is not a period of relaxation, because again, in an unprecedented way, the old team of Obama is trying to create conditions for the incoming President Trump to force him to continue on the pathway of Obama. For example, just a couple of days ago, they started a deployment of U.S. and NATO troops to the Russian border in the Baltics, in Poland, and in Romania, through the German city of Bremerhaven, where 6,000 troops landed with heavy military equipment; for example: U.S. Abrams tanks, Paladin artillery, Bradley fighting vehicles, 2,800 pieces of military hardware, 50 Black Hawk helicopters. This involving 1,800 personnel, with 400 troops to be attached to the 24 Apache helicopters. Now, obviously, the deployment of this is supposed to be a provocation against Russia, and it’s supposed to make it very difficult for Trump to start to improve relations. A second area where you can see this effort to pin Trump down, is the question of the THAAD missiles in Korea, where now North Korea has claimed to be able to be able to launch their ICBMs anywhere, any time; and according to Chinese experts, the United States is entirely to blame for the fact that North Korea is behaving this way. In South Korea, outgoing President Park Geun-hye, who may be impeached soon—actually in days or weeks—has agreed to accept a special task force of 1,000-2,000 which is supposed to eliminate the Pyongyang command under conditions of war, including Kim Jong-un; and obviously this is aggravating the situation, because given the history of such things, one is not sure when is the moment for such action. Thirdly you can see it with the deployment of the U.S. aircraft carrier group USS Carl Vinson to the Western Pacific, in the vicinity of China. This aircraft carrier is of the nuclear-powered Nimitz class, and it will arrive exactly on 20th of January, the day Trump takes office. Global Times, the official Chinese newspaper, said that this deployment is set to disrupt potential talks between China and other countries in the region; naturally, it’s also supposed to put a sour note into U.S.-China relations. There are other efforts to change and determine the narrative in the post-Obama period. Ash Carter, the U.S. Secretary of Defense, just gave a press conference where he said that it was only the United States which has fought ISIS in Syria. Now, it takes some nerve to say that, because everybody in the whole world knows that without President Putin’s decision to militarily intervene in Syria starting in September 2015, and the tremendous support of the Russian Aerospace Forces for the fighting of the Syrian troops, the present military situation in Syria would have never developed. And it was to the contrary, the very dubious behavior of the United States supporting various kinds of terrorist groups which prolonged this process and slowed it down. So this was quite different. And you know this attempt to fix the narrative will not be successful. Now, I cannot tell you what this Trump administration is going to be. I think I mentioned the one point I’m pretty confident about: I think we will see probably only by February or even into March who will be actually in his cabinet, who will get approved by the Senate. But there are other interesting elements. For example: Trump had promised in the election campaign to invest $1 trillion into the renewal of the infrastructure in the United States. That is very good, as I said, because the United States urgently needs repair. It will, however, only function if at the same time, another promise by Trump, namely, what he promised in October in North Carolina, that he would implement the 21st Century Glass-Steagall Act, is also carried out, because the trans-Atlantic financial system remains on the verge of bankruptcy. You could have a repetition of the 2008 financial crash at any moment; and only if you have a Glass-Steagall law in the tradition of Franklin D. Roosevelt—what Roosevelt did in 1933 by separation of the banks, by getting rid of the criminal element of the banking system, and then replacing it by a credit policy in the tradition of Alexander Hamilton—can you remedy this situation. Otherwise, you cannot finance $1 trillion in infrastructure. But one step in a positive direction is the fact that for example the former deputy foreign minister of China, and chairwoman of the Foreign Affairs committee of the National People’s Congress, Mme. Fu Ying, made a speech in New York, about six weeks ago, where she said that indeed the Trump infrastructure program can be a bridge to the New Silk Road program of China. And that is quite the case: Just yesterday, Trump met with Jack Ma, who is the chief executive of Alibaba, a Chinese e-commerce firm, and Jack Ma said that he can help Trump to create a million jobs in the United States by initiating a platform for U.S. small businessmen to sell to Chinese consumers over the next five years, and vice versa, how the Chinese can invest in the United States. Trump afterwards said this was a great meeting, we will do great things together; and Jack Ma said that Trump was a very smart man and they got along very well. So this is very good, because the Schiller Institute in 2015 published a report calling for the United States to join the New Silk Road, which is a whole approach including how you have to have a fast train system for the United States. 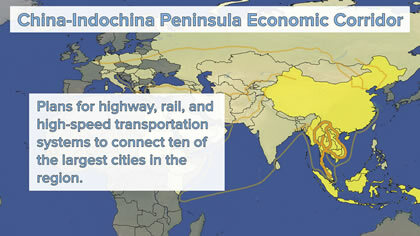 As you know, China has built 20,000 km of high-speed train systems. This high-speed network has doubled in only three years, and is expected to nearly double again by 2025, and reach 45,000 km in 2030. And the United States has none. So the United States urgently needs a fast train system connecting the East Coast, the West Coast and the Midwest. Build some new science cities in the South, and get rid of the drought in the Southwest, California and the other states. So there are many, many things which urgently need to be done. Okay. Now, let me make a few remarks about the Schiller Institute, given the fact that many of you may not know much about us. And I want to underline the fact that we are not commentators on this whole question, but that we are responsible for many of the ideas which are now coming into effect. The Schiller Institute was created by me in 1984. At that time we had the intermediate-range missile crisis, which brought the world to the verge of World War III; if you remember, we had the Pershing 2, and the Russians the SS-20, both on permanent alert, where there was a very short warning time, and the relationship between Europe and the United States was really in a terrible condition. So I created the Schiller Institute with the idea that you needed an institute, a think-tank to put the relations among nations on a completely different basis. One of the most important aspects of the work was to work towards the establishment of a just, new world economic order, in the tradition of the Non-Aligned Movement. And there, my husband, in 1975, had proposed to replace the IMF with an International Development Bank, which would organize large credits for technology transfer from the industrialized countries to the developing sector, to overcome underdevelopment. That proposal went into the Colombo Resolution of the Non-Aligned Movement in 1976 in Sri Lanka. So we had the idea that that policy had to come back on the agenda, that we had to create economic development in the southern hemisphere, so that every human being on this planet could have dignified potential for their lives, to develop all the potentialities embedded in them. But from the beginning, we said that such a new world economic order can only function if it’s combined with a Classical Renaissance—that we have to reject the popular culture associated with modern globalization, because it is depraved and degenerate. And that we had to go back to the revival, a Renaissance, of the best traditions of every culture, and have a dialogue among them. For example, in Germany, obviously you would emphasize the German Classical culture of Schiller, Beethoven, and all of Classical music; in China, you would emphasize Confucius; in India you would emphasize the Vedic writings, Tagore, and so forth. So you would go and revive in every country simply what they have contributed to universal history, and make that known. Now, the present Chinese policy of “win-win cooperation,” is exactly an echo of what we had proposed since 1984, to replace geopolitics with an approach for the common aims of mankind. In 1984, my husband, Mr. LaRouche, also uniquely predicted the collapse of the Soviet Union. He said if the Soviet Union stuck to its then-prevailing policies of the Ogarkov Plan, that it would collapse in five years. Now, there was nobody else who was saying the Soviet Union would collapse; it was completely unthinkable—but we observed the economic problems. And on Oct. 12, 1988, my husband and I held a press conference in Berlin, in the Bristol Kempinski Hotel, where we said that Germany will soon be unified—nobody believed that either at the time—and Germany should adopt the development of Poland as a model for the transformation of the Comecon through high technology. Now, in 1989 therefore, when the Berlin Wall came down, we were the only ones who were not surprised. As a matter of fact, we immediately published a report, on how a unified Germany should develop Poland, and we called this program, the “Productive Triangle Paris-Berlin-Vienna,” which is an area the size of Japan. It had the highest concentration of industry, and the idea was to build development corridors from that Productive Triangle to Poland, Warsaw, Kiev, and the Balkans, and transform the Comecon that way. It was before the D.D.R. [East Germany] collapsed; and if that had been picked up, maybe the Soviet Union and the Comecon would not have collapsed. But because you had Bush, Thatcher and Mitterrand, they did not like this at all. So in 1991, when the Soviet Union collapsed, we immediately proposed to expand this program of the Productive Triangle into the Eurasian Land-Bridge: The idea that you would connect the population and industrial centers of Europe with those of Asia, through development corridors. The Iron Curtain was no longer there, so it was the natural thing to have infrastructure corridors to develop the landlocked areas of Eurasia. Now we proposed this at the time to all the countries of Eurasia, and the only country which responded positively was China. So in 1996, they organized a very big conference in Beijing, called “The Development of the Regions along the Eurasian Land-Bridge,” and I was one of the speakers. And China at that point declared the development of the Eurasian Land-Bridge to be the long-term perspective of China through the year 2010. As you know, then came the 1997-1998 Asia crisis and the Russian GKO crisis, so this whole development became interrupted. But that did not stop us from holding conferences about this proposal on five continents, in all U.S. cities, all European cities; and even in Latin America, in Sao Paolo and Rio; in New Delhi, and even in some African countries and Australia. We kept organizing for the idea that the natural next phase of the evolution of mankind would be the infrastructure connections of the entire planet. Obviously, what also happened in 1999 was the repeal of the Glass-Steagall Act in the United States, which unleashed unregulated speculation, leading to the present bubble. Now, in September 2013, when Xi Jinping in Kazakhstan announced the New Silk Road, we simply took all the different studies we had made during those twenty-four years, and published them, and we called it The New Silk Road Becomes the World Land-Bridge. This is a comprehensive proposal which has the yellow line there in the middle between China and Central Asia; this was the initial One Belt, One Road proposal by China, and we added simply—they also had the Maritime Silk Road—but we had a whole infrastructure program for Africa, for the South of Europe, the Balkans, with many corridors, including a Bering Strait Tunnel connecting the Eurasian infrastructure with the American system, with highways and high-speed trains all the way to Chile and Argentina. And eventually, when all of this is built, you will go by maglev train from the southern tip of South America to the Cape of Good Hope in Africa. We published this proposal; and the actual book you can find at the book table, including an early report about this, from 1997. The first report we published in German, in 1991. This is not just about connection of infrastructure, but it has all the scientific conceptions of Mr. LaRouche’s notion of physical economy. Mr. LaRouche is probably the only economist in the West who deserves that name, because all the neo-liberal economists have been so wrong in their predictions that they should probably take another job. Mr. LaRouche has given us his own scientific method, and in this report you will find such extremely important conceptions as the connection between energy-flux density in the production process, with the relative potential population density, which can be maintained with that energy-flux density, and there are other such important conceptions. So this report was immediately published in China; the Chinese translated it into Chinese. We presented it in China in 2015. It was recommended by all the people who presented it, to all Chinese scholars, as the standard text on the Silk Road; and it has been sent to all major faculties and universities in China. It was also published in Arabic, as you will hear from Hussein Askary. And it is now coming out shortly in Korean, in German, and we have requests for it to come out in other languages also. 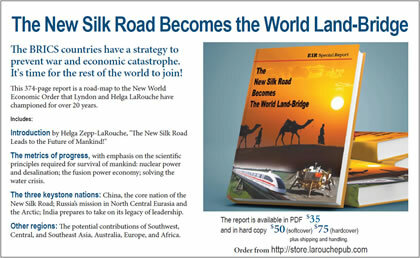 So, while we were publishing these reports, the New Silk Road promoted by China has taken on a breathtaking dynamic. It has a few different names—first they called it “One Belt, One Road”; now they call it the “Belt and Road Initiative”; I always call it the “New Marshall Plan Silk Road,” so that people get an idea. In the meantime, many of these proposals are in different phases of realization. 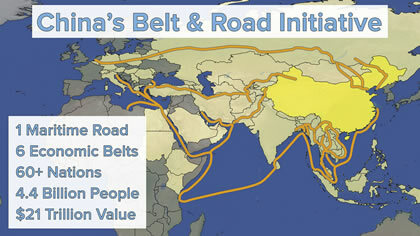 There is the Maritime Silk Road, as you see on the maps. And China is building six overland economic corridors—as I said, it involves 70 nations, and over 30 international large organizations, 4.4 billion people, and trillions in investments. And as I said, already now it’s 12 times bigger than the Marshall Plan was. There is the original One Belt, One Road, connecting China and Central and West Asia through an economic corridor. In June 2015, China and the five Central Asian governments agreed to build that, and additional routes are being planned to go into Afghanistan. One is already going into Iran; when President Xi was in Iran last year, he promised—or they both promised—that they would extend this New Silk Road beyond Iran into Iraq, Afghanistan, Syria, Turkey. There is the new Eurasian Land-Bridge which connects China with Western Europe, and it has already shortened the transport time for cargo, to two to three weeks from China, to different cities—from Chengdu, Chongqing, and Yiwu, to Duisburg, Lyon, Rotterdam, and Hamburg, from five weeks via ocean. Already by mid-2016, there were over 2,000 rail shipments from China to Europe, and it is picking up speed. All the cities in Europe that are termini, such as Madrid, Lyon, Duisburg, they’re all happy; they realize that they have tremendous benefits from it. There is the China-Mongolia-Russia corridor. In June 2016, the three presidents signed a trilateral economic partnership, at the 11th Shanghai Cooperation Organization meeting; and this corridor alone involves 32 projects. There is the China-Pakistan economic corridor, which is creating 700,000 new jobs in Pakistan. 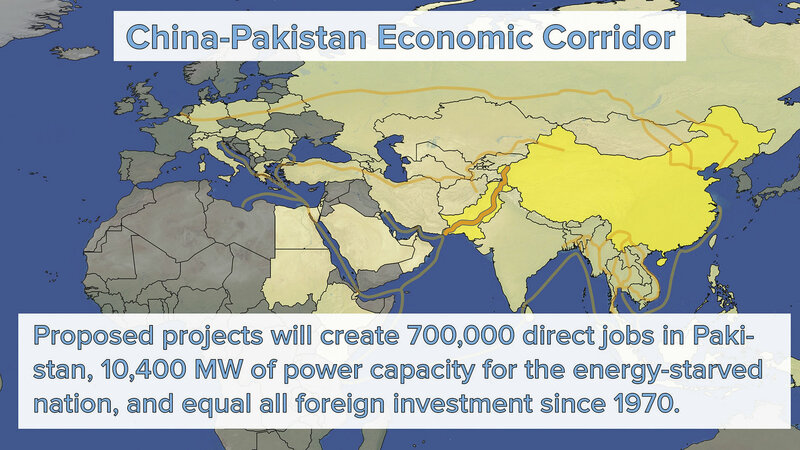 It will produce 10,400 MW of power capacity, and the investment of $46 billion by the Chinese in this corridor equals all the foreign investment since 1970 in Pakistan. There is the China-Myanmar-Bangladesh corridor. This is creating an express highway between India and China for the first time, and it goes through Bangladesh and Myanmar. This corridor will be 1.65 million square kilometers; it will encompass 440 million people. There is the China-Indochina Peninsula corridor. This will be a highway/rail and high-speed transport system connecting the ten largest cities of the region. In Africa, we have the Djibouti-Ethiopia route. Because, as we know, Europe has been in large part destabilized by the refugee crisis, and there is a very big incentive, one would think, for Europeans to help develop Africa. But so far it is not coming from Europe, it’s coming from China, India and Japan. Now, there is another extremely important project, which is the Transaqua project. There is a Memorandum of Understanding between the Lake Chad Basin Commission and the Chinese engineering firm PowerChina. Now PowerChina is the company which built the Three Gorges Dam and several other large projects, so they really know what they’re doing; and they agreed in this contract to do a feasibility study for the Transaqua project. This is the largest infrastructure project ever entertained in Africa. It was developed in the late 1970s by the Italian firm Bonifica, and there, in particular, by Dr. Marcello Vichi. Mr. LaRouche has promoted this project since he got news of it, because it was a perfect way of solving many problems at the same time. As you know, Lake Chad is shrinking; it is presently only about less than 10% of its original size, and it affects the life of the entire people, 40 million people, in the Chad Basin. And naturally, it is already having drought effects and so forth. The concept is simply to transfer water from the Congo River, using the unused discharge of the Congo River water going into the ocean. Now, the Congo River is the second largest river in the world, and it discharges 41,000 cubic meters/second into the ocean—unused. And the idea is to take only 3-4% of that water and bring it into Lake Chad. There was a big campaign trying to convince the people in the different states along the Congo River that it’s stealing their water, and so forth, but that was really an effort by the Greenies, and it has no substance to it whatsoever. First of all, the idea is not to take the water from the Congo River, but from the west bank tributaries at an altitude that allows one to bring water by gravity into the Chad/Central African Republic watershed, which is at an elevation of 500 meters, and then pour it into the Chari River, which is a tributary of Lake Chad. So this way you would create a 2,400 km long waterway which would eventually bring 100 billion cubic meters of water per year into Lake Chad, and also create navigable infrastructure. Obviously, the Democratic Republic of Congo would be also a big beneficiary, because it would obtain access to a navigable waterway, electricity production, regulation of rivers and so forth. PowerChina is now financing a feasibility study for a first phase of the project which would involve building a series of dams in the Democratic Republic of Congo, the Republic of Congo, and the Central African Republic. It would also potentially generate 15-25 billion kilowatt-hours of hydroelectricity through the mass movement of water by gravity; it would potentially create a series of irrigated areas for crops and livestock, of an area of 50-70,000 sq km in the Sahel zone in Chad, in the northeast of Nigeria, in the north of Cameroon, and in Niger. 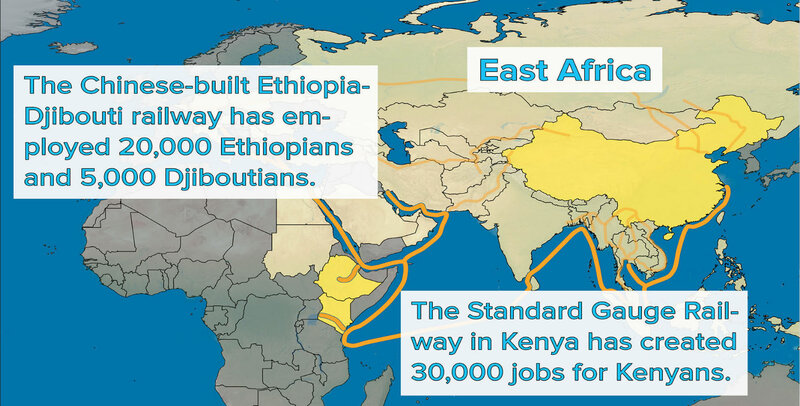 It would also make possible an expanded economic zone, creating a new economic platform for agriculture, industry, transportation, and electricity for twelve African nations. So PowerChina has put up $1.8 million for the first phase of the feasibility study, and if the construction starts, this is a big project, so it’s not expected to be finished overnight, but it will take generations: But it will create livelihoods for 40 million people in the basin. And this is just one project, but there are many others. For example, Chinese Foreign Minister Wang Yi is just on a five-nation tour through Africa, and was already in Madagascar and Tanzania, and is going to Zambia, Nigeria, and Republic of Congo, and he’s inviting all African nations to join the Belt and Road Initiative. We have proposed an expanded program of railways and nuclear power, just transforming the entire African continent. There are development plans for Latin America, high-speed railway routes in Latin America, which the Schiller Institute has proposed. In 1982, when Mr. LaRouche was working with President Jose Lopez Portillo of Mexico on these projects, he called it “Operation Juarez,” to refer back to the best traditions of Mexican-American cooperation. And these are all projects which are obvious. If you look at a map of Africa or Latin America, you don’t see that kind of infrastructure! If you see some railway, you see it as a small line from a mine to the port to exploit the raw materials, but you don’t have infrastructure. And we had this idea, which Alexander von Humboldt, by the way, proposed in 19th Century, so it’s not that revolutionary; it’s sort of obvious. The Chinese have made various proposals since the BRICS summit in Brazil in July 2014. There is a northern route of the Brazil-Peru transcontinental rail line. This was already agreed upon between the governments of Brazil and China a year ago; but then they had the coup in Brazil, Dilma Rousseff was impeached, so this came to a halt; also the new government in Peru is very reluctant. But there’s a big movement: I just addressed a conference of economists in the Amazon region two months ago, and there’s a whole movement, also associated with the Fujimori party, who absolutely want to fight for that rail line because it is the step to the future. There are three additional lines. One line would include Bolivia in this rail line, and there are three additional lines through Argentina and Chile; China also wants to build three tunnels between Chile and Argentina to connect the Pacific and the Atlantic. This is the Nicaragua Canal, which is in the early stages of completion, also built by China. This will increase the speed of global shipping between Belem and Shanghai, and cut the time of the current route across the Atlantic and around Africa by 10%. So I can only mention the most important projects. There are many, many others. For example, China and Ecuador are building a science city in Ecuador. President Correa, during the recent state visit of President Xi Jinping, said that the collaboration between Ecuador and China will mean that Ecuador soon will be on the same level as all industrialized countries. They have the idea of overcoming poverty forever. The science city is going to do work in the most advanced fields of science. Bolivia, which used to be a coca producing country, is now cooperating on space projects with China, with Russia, with India. So there is a completely new mood! I talked with many Africans—there was a big conference in Hamburg just a couple of months ago, where the Africans said that there is a completely new mood in Africa, there is a new paradigm: China, Japan, India are all investing, and the Europeans, if they don’t shape up, will become marginal and irrelevant. So there is a completely new optimism caused by this dynamic. Now, just on the diplomatic level, this process of integration is going absolutely rapidly, especially since September of last year, when you had on Sept. 2-3, the Eastern Economic Forum in Vladivostok, where the integration of the Eurasian Economic Union and the Belt and Road Initiative was on the table. Japanese Prime Minister Shinzo Abe participated in that conference, and Japan is now massively investing in the Far East of Russia, in terms of energy cooperation. Putin was just in Japan, on a state visit; Abe will go on a state visit to Russia this year. They’re talking about settling the conflict concerning the Northern Islands, the Kuril Islands. They’re talking about a peace treaty between Russia and Japan, and obviously there is a complete strategic realignment going on. President Duterte changed the role of the Philippines from being the aircraft carrier for the United States in the South China Sea, to now collaborating with China on economic cooperation, and also with Russia. The same, by the way, goes for Turkey, which is now shifting and working with Russia, Iran and Syria, to bring peace to the region. So there is a complete strategic realignment going on, and the Western media and Western politicians have just not got it yet. But this is very, very interesting. So then this momentum continued. From Vladivostok, immediately afterwards, on Sept. 4-5, to the G20 Summit in Hangzhou, where China took real leadership in saying the future recovery of the world economy must be based on innovation and Xi made very clear that this innovation must be shared with the developing countries, so as not to hold up or hinder their development. So, it’s a completely new paradigm, and I’ll say something about that in a second. Then you continue to the ASEAN meeting in Laos, the BRICS meeting in Goa, India, in October, the APEC meeting in Lima in November, and it involves all of these organizations and is spreading very fast. Why doesn’t Europe join this? Look, Europe is in bad shape. The EU is collapsing, the people in Italy by now hate the European Central Bank, they hate Merkel, they hate Schäuble, they hold Merkel responsible for the suffering of the population in Italy, which is now reaching dimensions like Greece; Greece was destroyed—one-third of the Greek economy was destroyed by the austerity policy of the Troika. And you know, there’s nothing left of the idea of unity in Europe. There are borders being built, the Schengen policy is dead; look at the Eastern European countries—the Eastern European and Central European countries are reorienting towards China! The 16+1 are the Central and East European Countries; they have extensive infrastructure cooperation with China. China is building up Piraeus port in Greece; they’re building a fast railway between Budapest and Belgrade, and many other projects. But the problem with Europe, is that at least the European EU bureaucracy and some governments, like the German government, are are still on the old paradigm, the geopolitical paradigm of globalization, of neoliberal policies, and they don’t understand that by what China has proposed, and what is now the basis of a very close and determined strategic partnership between Russia and China—they have put on the agenda a different model: To overcome geopolitics by a “win-win” strategy. Now, most people, at least in Europe and in the United States, have a very hard time understanding that. They cannot imagine that governments are for the common good, because we have not experienced that for such a long time. The common idea of all the think-tanks, or most think-tanks, is “China must have ulterior motives”; “China is just trying to replace Anglo-American imperialism, with a Chinese imperialism.” But that is not true! I mean, I’m not naive: I have studied this extensively. I was in China for the first time in 1971, in the middle of the Cultural Revolution. I have seen China as it was then, I travelled to Beijing, Tianjin, Qingdao, Shanghai, and to the countryside, and so I know what an enormous transformation China has made in this period. I went back to China in 1996, after 25 years; already then it was breathtaking. But if you look, the Chinese economic model has raised 700 million people from extreme poverty to a decent living standard; China is now committed to developing the interior region as part of their building of the New Silk Road, to eliminate poverty from China totally by the year 2020—and there are only 4% left in poverty right now. Now, China is offering their Chinese economic model to all participating countries in this New Silk Road conception, and it is in the interest of Sweden. It would be in the interest of Germany, because Germany is still—despite the Green insanity which has deformed many brains—is still a productive country. The German Mittelstand (small and medium industry) is still producing, I think, the third largest number of patents in the world. It is their natural interest to find cooperation not only in bilateral cooperation, but in investments in third countries. It would be in the best interest of Germany: if Germany is freaked out about the refugees, which really has meant a complete destabilization of the country, then why is Germany not cooperating with Russia, China, India, and Iran, in the reconstruction of the Middle East? Now the Syrian government has started to rebuild Aleppo, at least to rebuild the hospitals and the schools. The Schiller Institute proposed in 2012, a comprehensive proposal for the development of the entire Middle East, from Afghanistan to the Mediterranean, from the Caucasus to the Gulf States, and it would be in the absolute self-interest of Germany because—sure you have to destroy ISIS and the terrorists with military means—but then you have to create conditions where young people in Syria, Iraq, Afghanistan, and Yemen, have a reason to become doctors, scientists, and teachers, so that they have a future, in that way you drive out terrorism forever! And if all the big neighbors would cooperate—Russia, China, India, Iran, Egypt, Turkey, Italy, France, Germany, and Sweden—you could change this region in no time! And you will hear about that soon from Hussein. The same for Africa. The only minister in Germany who is reasonable is Development Minister Gerd Müller, because he travels all the time to Africa and he says there will be the need for many millions of jobs for the young people of Africa in the next years; if we don’t create these jobs, many, many millions of people will flee from hunger and war and epidemics. So would it not be in their self-interest that all the European nations join hands with the Chinese Silk Road initiative, and help to reconstruct and build up the economies of Southwest Asia and Africa? I think that that mission would also really help to overcome the disunity of Europe, because you will not solve that problem by looking at your navel; but you will solve that problem by a joint mission for the greater good of mankind. So, I think that this is all possible. It can happen this year, it can start this year, because China has committed itself to have two big summits this year—one summit will involve all the heads of state of the Belt and Road Initiative, and it can be the year of consolidation of the new paradigm. Now there are a couple of elements which are also important for this new paradigm, because we are not just talking about infrastructure and overcoming poverty. The next phase of the evolution of man is not just to bring infrastructure to all continents on this planet, but to continue that infrastructure into nearby space around us. This was formulated in this way for the first time by the great German-American space scientist and rocket scientist Krafft Ehricke, who made fundamental contributions to the Apollo project. He had the beautiful vision that if you look at the evolution over a longer period of time, life developed from the oceans with the help of photosynthesis; then you had the development of ever higher species, species with a higher metabolism, higher energy-flux density in their metabolism. Eventually man arrived. Man first settled at the oceans and the rivers; then with the help of infrastructure, man developed the interior regions of the continents; and we are now with the World Land-Bridge picture—this will be, when it is built, the completion of that phase of the evolution of mankind, by simply bringing infrastructure into all the landlocked areas of the world, and with the help of new methods to create water, with modern technologies, we will create new, fresh water. For example, if you have peaceful nuclear energy, you can desalinate huge amounts of ocean water; through the ionization of moisture in the atmosphere, you can create new water to solve the problem of desertification. Right now all the deserts are growing; with these new technologies you can reverse that, make the deserts green, and just make this planet livable for all human beings! But this is not the end: Mankind is not an Earth-bound species. Mankind is the only species which is capable of creative discovery, and the collaboration of all nations for space exploration and space research is the next phase of our evolution. Now China has a very ambitious space program. It landed the Yutu rover on the Moon in 2014. Next year it will go to the far side of the Moon, and eventually bring back helium-3 from the far side of the Moon, which will be an important fuel for fusion power economy on Earth. Right now, we are very close to making breakthroughs on fusion power. The Chinese EAST program [Experimental Advanced Superconducting Tokamak] has reached 50 million degrees in plasma for 60 seconds under high confinement. And just a couple of days ago, the plasma configuration in the stellarator in Greifswald, Germany, was proven accurate to one part in 100,000. But it means that in a few years, we can have fusion power! And that will create energy security, raw materials security, on Earth. We’re looking at a completely new phase of civilization, and the far side of the Moon is very important because it will not have radio-frequency noise, as you have on the Earth-facing side of the Moon; this far side is shielded from a lot of this radio-frequency noise, so it will be possible to put up much better radio-telescopes, and so you will be able to look into Solar system, into the Galaxy, into other galaxies much, much farther than so far. 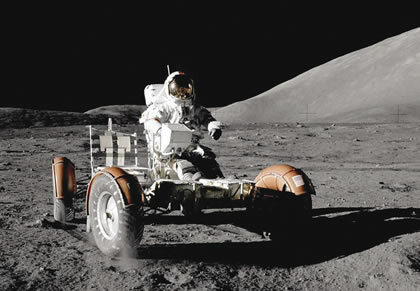 Apollo 17 lunar roving vehicle. I don’t know if any of you have seen the latest pictures from the Hubble telescope: If you have not done that, please, go home and take the time to look at these pictures from the Hubble telescope. I saw them, and I was completely excited, because now we know that there are—at least—two trillion galaxies! Now, I have a good imagination, but I cannot imagine that. It’s just too big. And when you see the pictures which have already been taken, you have galaxies which look like the Milky Way; then you have totally different nebulas; you have all kinds of formations. And not one galaxy is like the other. Just imagine how big the Universe is! And we know very, very little! But man is the only species which can know! No donkey will ever know about the great galaxies or—no dog will ever be able to breed rabbits to have a better breakfast. They all want a better breakfast, but they don’t know how to do it. Man is capable of overcoming every limitation, and the mind of man is a physical force in the Universe. We’re not outside of the Universe, but what our mind invents or discovers, is part of the Universe. And that is a very exciting thing. Krafft Ehricke had said that building an industrial center on the Moon will be important as a stepping stone for further travel in space. And you now see the shaping up of new economic platforms. 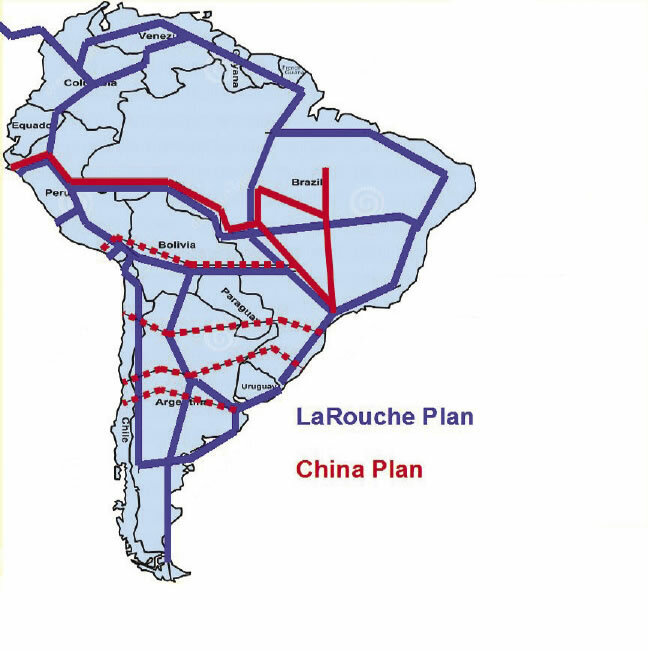 Mr. LaRouche has developed this notion of an economic platform to signify a period of economic development which is governed by certain laws, like for example, the development of the steam engine created a new platform; the development of the railway created a new platform; fission is creating a new platform. And the platform is always governed by the most advanced technologies of that time. You can already see that in the infrastructural development of nearby space, the first platform is simply that man is able to reach Earth orbit! That’s not self-evident. If you had told man in the Middle Ages that you will get on a spaceship and go into orbit, he would have said you’re crazy! Now we can already see we have manned space travel, and we can now connect to where the Apollo project stopped after the assassination of Kennedy, 40 years ago; but now China, India, Russia, they are all continuing that process. India also has an extremely ambitious space project. And so, the first economic platform will be simply to leave the planet Earth and to go into orbit; the second economic platform of space research will be to have an industrial base on the Moon, and to eventually start to produce raw materials from space. Because you will, as this continues, not always transport materials from the Earth for your space travel, but once you have fusion as a propulsion fuel where the speed will become much greater, you will be able to take materials from asteroids and from other planets, for your production and your requirements in space. And then longer space travel between planets as the third platform, which is already visible. This is very exciting, and once you start to think about it, it shows that mankind is really capable of magnificent achievements, and that we should really overcome geopolitics. Geopolitics is like a little, nasty two-year-old boy who is not yet educated, and who knows nothing better than to kick his brother in the knee. That’s about the level of geopolitics.What Xi Jinping always talks about is that we have to form a “community of destiny for the common future of mankind,” and that is exactly what the Schiller Institute set out to do in 1984, when we said we have to fight for the common aims of mankind. And these common aims of mankind must come first, and no nation should be allowed to have a national interest or the interest of a group of nations, if it violates these higher common aims of mankind. And the areas of working together include a crash program for fusion, space cooperation, and breakthroughs in fundamental science. All of this however must be combined with a Classical Renaissance, a dialogue of cultures on the highest level, and we have already very successfully practiced that at Schiller Institute conferences, where we had European Classical music: Bach, Beethoven, Verdi, Schubert, and Schumann; Chinese Classical music; Indian poetry. We will have this coming Saturday in New York, a beautiful event on dialogue of civilizations, of cultures, where we will have a Chinese professor talking about literati painting. You know, in Chinese painting, you have poetry, calligraphy and painting, in one. And for Westerners, it’s a complete revelation, because this does not exist in European painting. People get completely excited, because they discover that there are beautiful things to discover in other cultures! And once you study and know these other cultures, xenophobia and racism disappear! Because you realize that it’s beautiful that there are many cultures, because there are universal principles to be discovered in music. One musician will immediately understand another musician because it’s a universal language. Scientists speak a universal language; they understand each other. And so the future of civilization will be a dialogue between Plato, Schiller, Confucius, Tagore, and many other great poets and scientists of the past. So, if you give every child access to these things, which is also in reach, I can see that we will have a new era, a new civilization of mankind. And I would invite all of you to not just look at it, but be part of it.